We’re now at the end of a 1.5-year study to help Silicon Valley’s local transit agency, VTA, rethink its bus network. I explained the thinking, and public conversation, that led to the draft final plan in this comprehensive post, and also showed how it compares to the existing one. The final plan looks pretty much like the draft one with a few additions and adjustments. Here’s the new network. Download a sharper copy here. 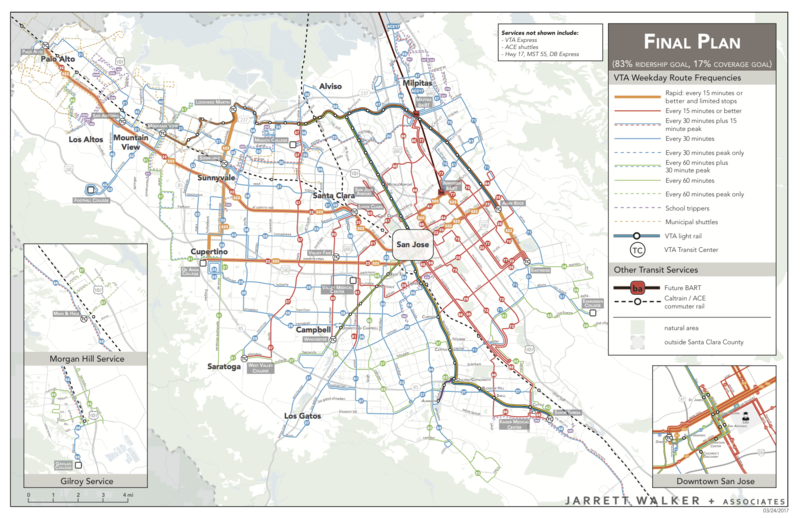 The plan is expected to be implemented when the BART extension into the area opens next year. You can explore the plan in more detail here, including maps, route-level info, and the background documents in the Board report. Most importantly, more people can get to more places sooner, so that they can do more things and have better lives. And that’s what we’re all about. It seems to me that if you’re near downtown San Jose, Barryessa Bart would be better? There’re really good connections between there and downtown. The stop on line 181 in Milpitas only exists on the weekends. On weekdays 181 heads straight to DTSJ and 180 provides express service from Fremont BART to Milpitas. I don’t think I’ve ever heard the rationale that the weekend stop in Milpitas is for people to get off the bus and take light rail all the way to DTSJ. I always thought it was a compromise to provide express service to two destinations with one bus. Anyway, under the new service plan the current 181 express bus ride from Fremont BART to Civic Center would be replaced by BART to Berryessa and transfer to Line 61, which takes 10 minutes to travel to Civic Center under the current schedule. The new network shows this line as red with all-day 15-minute service. Assuming 10 minute transfer time and 20 minute BART time, that’s 40 minutes. You would be hard pressed, on a weekday, to make it from Fremont BART to Civic Center in 40 minutes even in a private vehicle. I’ve personally taken several 181 rides that took over an hour between those two points. As far as fares are concerned, VTA has not, to my knowledge, released their proposed fare policy for the BART extension or BART-to-VTA transfers. Nonetheless, we could look at current fares and make some assumptions. Fremont to Bay Fair (about the same distance as Fremont to Berryessa) is $1.95, VTA bus is $2, and VTA currently provides a 50 cent discount for BART-to-VTA transfer. That comes out to $3.45, which is lower than current express bus fare. The unfortunately bad design of VTA light rail (circuitous, slow) is what’s really hurting you here. Light rail advocates around the world have complained about how poorly implemented VTA light rail was. The 1st Avenue line and the southern branches are OK (though they could have been done a lot better), but what were they thinking with the Alum Rock route? And the route to Mountain View is even worse. Sadly, a lot of my excitement for the new network has been dimmed by finding out my rapid 522 stop was eliminated ahead of this change. I actually bought my house partly because of the access to the rapid bus. It’s now just over a mile each way to the closest rapid stops, instead of a 1/4 mile. That’s a distance that is too far to bother walking, since the 15 extra minutes of walking will eat up the time savings for almost all my trips. Transferring isn’t much of an option since they also decreased the frequency of the local 22 for reasons I can’t comprehend. Thus gutting what was nine buses an hour to that stop down to only four an hour. The stop was quite popular too, I don’t understand why it was eliminated. I have to assume that it’s because not -enough- businesses and housing were there, though I also wonder if the overall hostility of the Alameda Business District to buses (the head of that organization actually called them ‘limos for the poor’) was a factor in eliminating good transit service to the area. The upcoming new rapid 523 on the other main line is an equal distance from me, but a direction I tend not to travel nearly as often, so the minor improvement over the 323 doesn’t excite. And another line I travel reasonably often was eliminated, making doctor’s visits more challenging in the future, but it should be manageable. With just one seemingly minor change, the loss of a bus stop, the overall effect for me from this will probably be far less bus utilization, more catching rides or staying in my neighborhood. But it’s not just about me, of course. Hopefully some people will ride the bus more. I’m also trying to have faith that with enough new housing along the 22 route, maybe we’ll get better frequency back. I really think it makes more sense to have the local have the greater frequency. I’m also hoping for some kind of shift on the transfers front, since right now I often don’t get a monthly pass, but if I’m going to have to transfer a lot more, it will start getting really expensive quickly, and I’m going to have to budget more for transit either way. But overall, I wasn’t super excited about the changes, but understood the vision, and now I’m just bummed that a neighborhood with formerly great transit access was sacrificed in the name of that vision. The solution to that aspect of forced transfers (we can’t all have single seat rides) iss the daily cap/day pass such that once you have boarded paid more than twice (for example) your clipper card shows a day pass good for the rest of the 24 hours since your first trip. There is some effort to make this change part of the clipper 2.0 process. Please take the time to lobby VTA to get on board with that change. Are there smartcard systems that have the specific functionality you describe? I suspect that the Genfare system in use here in Tucson would not be capable of it, but I don’t know whether it would require a full system upgrade or could be done with an add-on. So, I’m curious as to where In the US it is possible to roll that third ride into a day pass that starts the clock at the beginning of the first ride, and if so who is the vendor for their smart card system. Another question: in the system as you envision it, would there be an open transfer window such that a rider could get on two or three buses within a couple of hours, or would that second charge happen on the second boarding regardless? Not in the US, but here in Auckland we have a smart card system designed by Thales which has that functionality. I would like to point out though that the question at hand isn’t actually a technology problem; there are dozens of card systems that can do this but the operators don’t use it. This is almost always a policy question, and most policymakers probably work downtown and don’t make transfers trips, so they don’t see the advantage. 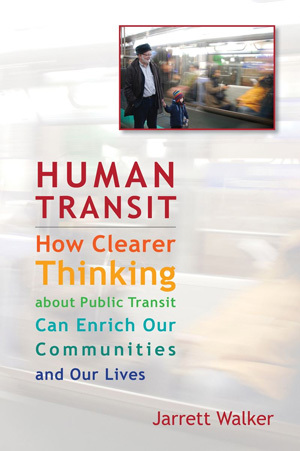 Unfortunately here most policymakers aren’t using transit at all. Whatever policy changes with regard to the fare structure that we push through (citizens advisory committee on transit) require a great deal of time and trial-and-error, as in “We’re working with the vendor…” I do not think in the US there are “dozens” of card systems available; I’m not an expert on that matter but my understanding is 5 to 7 compaines at most have this market wrapped up. And in our case I believe we took the low bid and picked a relatively cheap package, because other cities have spent far more than we did on getting the system in place to begin with. All the smartcard systems I’m aware of in the US (for buses anyhow) have limited functionality and choices are made between one thing and another so that each locality has some good choices available but not many. The potential of the smartcard system is FAR from being achieved. Very frustrating, since it has caused many problems for folks, and not (yet) made up for them, as far as I can see. George Lane, can a person make more than one boarding on a single-ride fare where you are? Or do they have to pay the whole day pass price after the first boarding? Yep. You just wave the card as you get on and off of the bus and it calculates your fare. We have fare zones and you get charged based on how many zones you pass through and get charged the same price regardless of how many vehicles you use to do it. This isn’t a technology question though. Any smart card system can do that. The transit authority in any area just need to decide to implement that policy within the card. If you aren’t convinced of this, then ask yourself which part of the technology required to do that does your system not use, there won’t be one. OK I should delete all my previous comments because… David Vartanhoff, VTA Clipper Card already does this. ?? Mea culpa. I had forgotten they do that. AC Transit does, too. “Automatically applied on the third trip when using Clipper.” It is SF Muni which doesn’t do this yet. Possibly George Lane misunderstood my question… I just looked at the Auckland Transit site to learn about the HOP card. It looks to me like you do have an open transfer window of 4 hours on one fare, as long as you don’t exceed 5 boardings or wait more than 30 mins between exiting one vehicle and boarding another. But with reference to the day pass, it looks like that’s a separate product, and only lasts until midnight on the day activated, not for 24 hours. Let me know if I’ve got that wrong! But the idea I really like for my community is the day pass that automatically activates at your third “tap” and lasts 24 hours from your first tap. It would eliminate having to carry two cards (one for day passes and one for continuous use of stored value) or to know your whole day’s plan in advance in order to get the best price. It would also incentivize more transit trips later in the day, rather than resorting to the car for an evening out once you’ve already used the bus or streetcar. This is what David Vartanhoff was describing… does it exist? Any info on revenue impact? You understand perfectly how the fare structure works in Auckland. However, you seem to think that this is related to the card used; it isn’t. This is a fare policy set by the local government. The card already collects all of the data used to implement either fare structure, or indeed both fare structures, our council/transit authority just doesn’t want to do that. I’m not sure about the detailed revenue breakdown; we introduced the card about four years ago and then introduced the free transfers last year (but we changed fares at the same time) total revenue dropped about 4%. VTA Clipper Card currently turns into a day pass at the third tap, but only in the VTA system. No idea what the fare impact was. I know that it does lead me to forego the expensive monthly pass a lot of the time, because my utilization is right on the edge where the occasional day pass makes more sense than the up front $70. For me, a lot of days I only make two trips, either there and back, or a two-step one-way trip. But with the routes changing, I’ll be racking up that third–and free fourth– tap more often, for traveling the same distance. For things like deciding whether to jump off the 22 to the 522, knowing that I’ll have to pay an extra couple bucks plus a wait is a strong disincentive to transfer, unless I know I’ll be making multiple stops that day. Along those lines where there’s a local and a rapid, a transfer window system is more appealing than a day pass one. But it’s not a big deal for my personal situation. Something that worked better between agencies for longer trips would be nice. Inter-agency there is very little fare coordination. Oh, and day passes expire at 3am. Not a full 24 hours, but doesn’t penalize most people who are using transit late at least.